Alternative from Almo Nature contains complete dry and wet food for adult cats. One pouch of Alternative contains at least 50% fresh chicken or fish which was originally deemed fit for human consumption. Chicken meat, sturgeon or salmon is the single source of protein. This makes the food ideal for cats suffering from food intolerances or allergies. Chicken meat is rich in proteins and low in carbohydrates. Furthermore, chicken meat is lower in calories than, for example, beef or pork. Fish is rich in Omega 3, a fatty acid which supports the joints and coat. Meat and fish form the main ingredients of Almo Nature Alternative. This adult cat food does not contain offal, only meat and fish deemed fit for human consumption. Since Alternative contains only one single source of protein and only one type of grain (rice), the food is suitable for cats suffering from food intolerances or allergies. Why is Almo Nature Alternative more expensive? Almo Nature Alternative does not contain offal. This cat food contains at least 50% fresh chicken meat or fresh fish with the HFC label. This means that all the meat and fish that is used in Alternative is deemed fit for human consumption. This quality meat and fish do not contain genetically modified organisms (GMOs) and are hence suitable for cats suffering from food intolerances or allergies. Chicken and rice dry food: Fresh chicken 55%, hydrolysed animal protein, corn gluten, chicken fat, eggs, yeast, minerals, salmon oils, cellulose, mannan-oligosacharides 0.2%, chicory inulin – source of FOS – 0.2%, vitamin A, vitamin D3, vitamin E, vitamin B1, vitamin B2, calcium D-pantothenate, vitamin B6, vitamin B12, vitamin C (3a300), choline chloride, niache, biotin, taurine, vitamin K, folic acid, copper sulphate pentahydrate, copper chelate of amino acids hydrate, 3b203, zinc oxide monohydrate, zinc chelate of amino acids hydrate, manganese sulphate monohydrate, organic selenium (3b8.10), calcium 1.2%, phosphor, potassium 0.6%, magnesium 0.12%, omega 3 0.53%, omega 6 3.69% and fluids 9.5%. Sturgeon and rice dry food: Fresh sturgeon 55%, rice, chicken fat, corn gluten, hydrolysed animal protein, yeast, potato, eggs, mineral, beet pulp, mannan-oligosacharides 0.2%, chicory inulin – source of FOS - 0.2%, vitamin A, vitamin D3, vitamin E, vitamin B1, vitamin B2, calcium D-pantothenate, vitamin B6, vitamin B12, vitamin C (3a300), choline chloride, niache, biotin, taurine, vitamin K, folic acid, copper sulphate pentahydrate, copper chelate of amino acids hydrate, 3b203, zinc oxide monohydrate, zinc chelate of amino acids hydrate, manganese sulphate monohydrate, organic selenium (3b8.10), calcium 1.51%, phosphor 0.96%, potassium 0.6%, magnesium 0.12%, omega 3 1.3%, omega 6 3.43% and fluids 9.5%. Salmon and rice dry food: Fresh salmon 55%, rice, chicken fat, corn gluten, hydrolysed animal protein, yeast, potato, eggs, minerals, mannan-oligosacharides 0.2%, chicory inulin – source of FOS – 0.2%, vitamin A, vitamin D3, vitamin E, vitamin B1, vitamin B2, calcium D-pantothenate, vitamin B6, vitamin B12, vitamin C (3a300), choline chloride, niache, biotin, taurine, vitamin K, folic acid, copper sulphate pentahydrate, copper chelate of amino acids hydrate, 3b203, zinc oxide monohydrate, zinc chelate of amino acids hydrate, manganese sulphate monohydrate, organic selenium (3b8.10), calcium 1.56%, phosphor 1.02%, potassium 0.6%, magnesium 0.12%, omega 3 1.5%, omega 6 3.43% and fluids 9.5%. Chicken breast wet food: Chicken breast 99.5%, rice 0.5%. Sardine wet food: Sardines 91%, sardine broth 8.5%, rice 0.5%. Indonesian mackerel wet food: Mackerel from Indonesia 91%, mackerel broth 8.5%, rice 0.5%. Atlantic Ocean tuna wet food: Atlantic tuna 91%, tuna broth 8.5%, rice 0.5%. Indian Ocean tuna wet food: Tuna from the Indian Ocean 91%, tuna broth 8.5%, rice 0.5%. Pacific Ocean tuna wet food: Tuna from the Pacific Ocean 91%, tuna broth 8.5%, rice 0.5%. 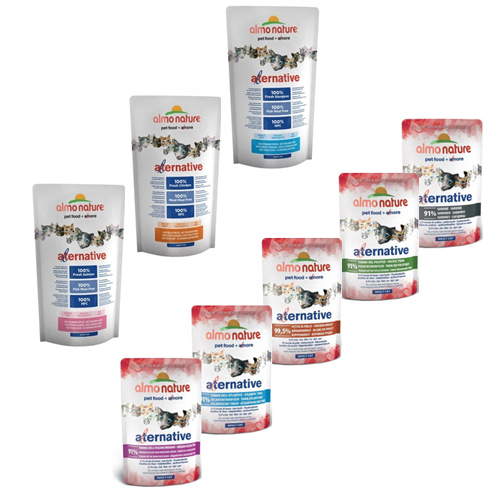 Have you used Almo Nature - Cat - Alternative before? Let us know what you think about this product.